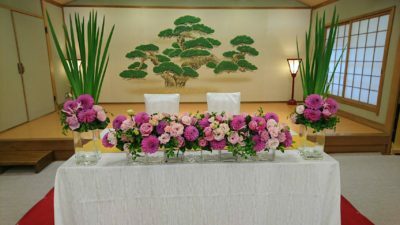 A gorgeous banquet room with a stage, decorated in modern and elegant style. 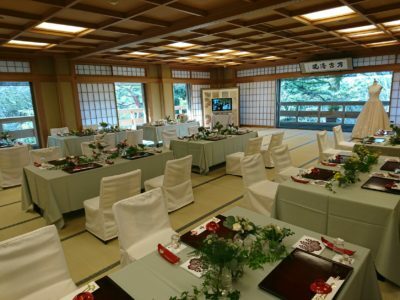 A spacious room with a view of Maruyama Park, with a coordination by the theme “natural”. 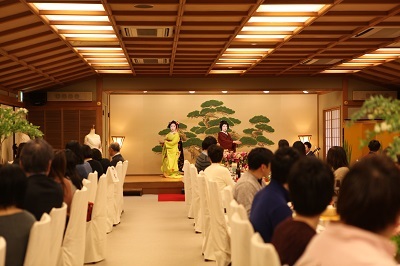 We held a “Bridal Fair” at Saami (ryoutei restaurant). It is 16th year since LST started holding bridal fair at Saami twice a year, in summer and winter. All the LST staff are really grateful that we are given this precious opportunity at the historic restaurant like Saami. 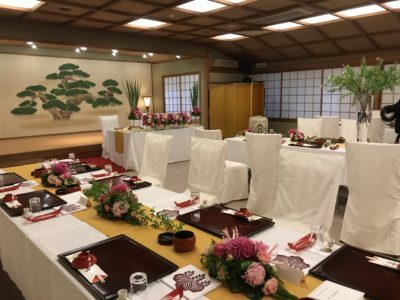 We welcomed many guests including the couples who are actually going to have their wedding reception at Saami in this Spring or Autumn, or others who are still considering where to have their wedding reception. We will make our best effort to provide good service to each and every client couple to make them happy. We would like to thank all, the guests including the groom and brides-to-be and their parents, Saami and our business partners for the great event today.